Patients who suffer from a severe form of stroke should be offered a procedure to remove the blood clot up to a day after the onset of their symptoms, draft new guidelines suggest. Undergoing a thrombectomy to remove the clot can significantly improve the chance of recovery for sufferers of an acute ischaemic stroke where blood vessels in the brain become blocked. The process is currently only offered to stroke patients up to 12 hours after symptoms start, but the National Institute for Health and Care Excellence (NICE) said that timeframe could increase. Alongside thrombectomy, the guidelines also recommend clot-busting drugs for those whose stroke has been caused by a clot in one of the larger arteries that carry blood to the brain. Director of the centre for guidelines at NICE, Paul Chrisp, said that new evidence has shown extending the thrombectomy eligibility period up to 24 hours could be very cost-effective. He said: "There is also a potential benefit for improved quality of life by reducing the level of disability people can experience as a result of a stroke. "These recommendations could lead to an increase in referrals to centres that already provide this procedure. Centres will also need to be able to provide or have access to 24-hour care, which will have an impact on NHS resources. 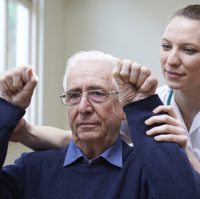 "However, balanced against this are the positive effects for other aspects of stroke care, such as a decrease in demand for inpatient rehabilitation and a reduction in the need for long-term social care." The draft guidance also includes updated eligibility criteria for decompressive hemicraniectomy, a procedure used to relieve increased pressure in the brain caused by certain types of stroke. Previously there were age-related criteria and patients aged over 60 were not offered the surgery, but patients of all ages will now be eligible. There are more than 100,000 strokes in the UK each year, costing the NHS an estimated £1.03 billion, with one in12 people who survive a stroke having to move into a care home. Ischaemic strokes happen when the blood supply to part of the brain is partially or completely blocked, killing brain cells. They account for around 85% of all cases. The other type of stroke - haemorrhagic - is caused by a bleed in the brain. If you're living with diabetes and looking for travel insurance that meets your specific needs then check out our dedicated stroke travel insurance and find the right cover for you.